What a way to start our Christmas Holiday! Our Key Stage 1 Nativity was absolutely wonderful. Along with Class 1, Class 2 worked so hard preparing for our Wriggly Nativity. We made sure our singing, dancing and acting was as good as it could be in order to perform the Nativity of the Year. I am really proud of Class 2 for their hard work this term and fantastic performance. I would also like to take this opportunity to say thank you to all of the children and their parents for the lovely Christmas cards and presents I received. Class 2, and to our families and friends! This week, we learnt all about the Annunciation when the angel Gabriel came down from heaven and told Mary she was going to have a child that would be very special. Angel Gabriel told Mary her son would be the son of God and called Jesus. We chose two people from our class to pretend to be Mary and angel Gabriel so we could hot-seat them. We asked them lots of questions and learnt a lot about this special event, particularly developing our understanding of how Mary felt after the angel appeared. Class 2 really engaged with our biblical story and we enjoyed learning more about the birth of baby Jesus in our special season of Advent. This week, we took part in some tasty design and technology! We had some exciting lessons in Class 2 designing and making our own marshmellow crispy cakes. 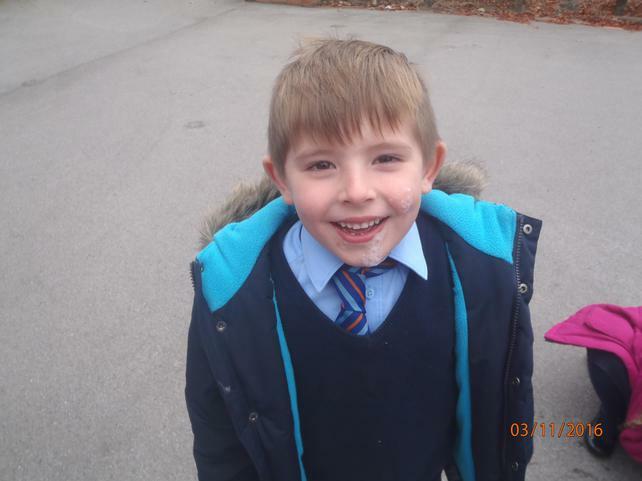 The children in Class 2 followed our recipe which involved melting ingredients to combine them. We thought about which ingredients might melt first, how the mixture would change and really enjoyed looking at our designs to make and enjoy tasting some wonderful creations. One of our wonderful Muck, Mess and Mixtures scientific lessons this week was making ice cream in a bag! We poured a cup of whole milk into zip-sealed bags and added a tablespoon of sugar. Then, we sealed and gently swirled the mixture. We half-filled other large zip-sealed bags with ice cubes and added six tablespoons of salt, sealed and enjoyed shaking the mixtures. We, then, opened the large bags and put the sealed bags of sweetened milk inside so they were surrounded by the salty ice cubes. We finally sealed the large bags and worked in teams to gently shake, and shake, and shake, the bags for five minutes. We then opened our bags and found some of us managed to create our very own frozen desserts! Class 2, and myself, had so much fun and learnt a lot this lesson. We found that salt lowers the freezing and melting temperature of ice and actually makes it colder. Also, with a lot of hard work and shaking, you can make your own ice cream without a freezer. 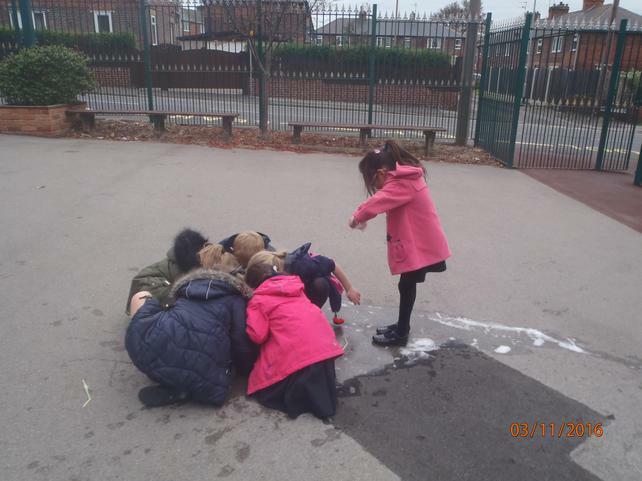 In Science we continued our Muck Mess and Mixtures topic, testing different soap products, such as washing-up liquid, bubble bath, hand wash, a bar of soap, and non-biological washing powder, to find out which created the best bubbles! 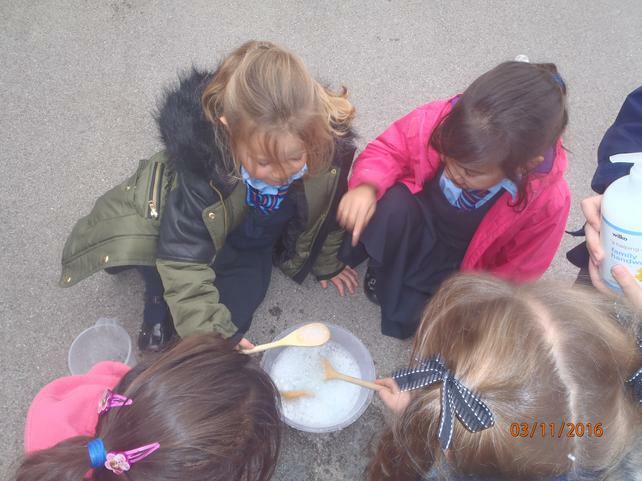 We made our own predictions and then used whisks, straws and sponges to create bubbles. We recorded which of the soap products created the longest lasting, biggest, smallest and foamiest bubbles. 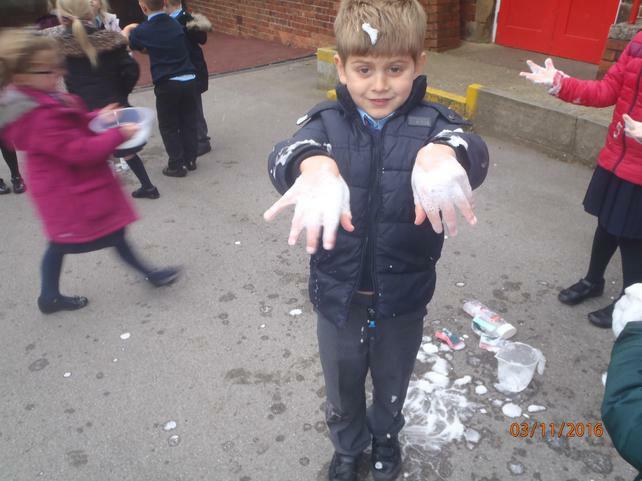 It was another messy experience but, we learnt so much and had lots of fun doing our experiment! 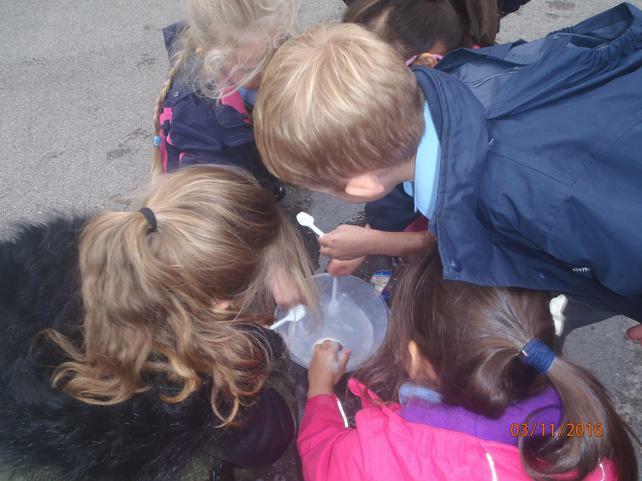 This week, we started our Muck, Mess and Mixtures topic with a very 'Messy Morning'. 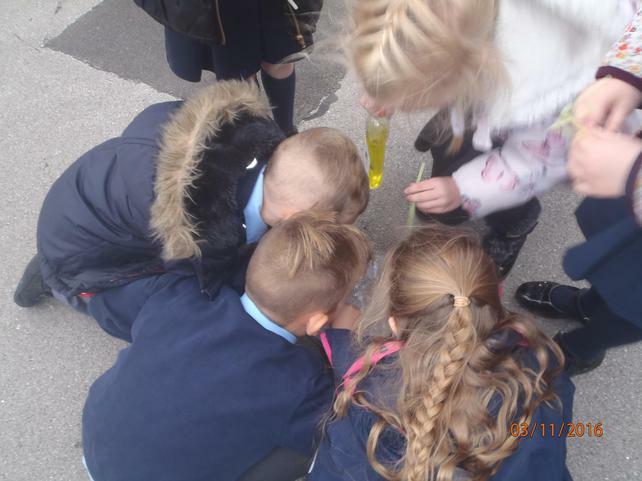 We thought of some ground rules for working in our class lab and went on to experience a variety of weird and wonderful mixtures that the children felt with their hands. We created different messy mixtures from a variety of ingredients and had so much fun mixing the ingredients together, smelling and touching the variety of mixtures we made. While we went around the carousel of activities in our classroom lab, we developed our ability to describe, writing descriptive sentences and adjectives on our working walls. 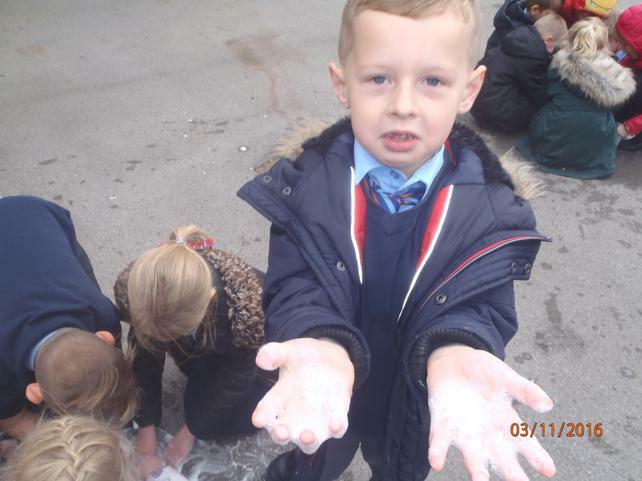 What a fantastic and very messy way to start our new topic!